Autumn with roses in the garden is a case of finishing off one growing season and starting to prepare for the next one. It is also a time to enjoy the blooms on the roses. There will not be as many as with a spring flush, but they make up for this with more vibrant colours. Continue dead-heading until the end of March then leave for the colourful hips to form. This is a feature often overlooked when growing roses. The autumn is a good time to assess the performance of individual roses over the past season. For any that are not up to standard sometimes shifting them to another part of the garden can give them a new lease on life. However for others they are probably best discarded. New season’s roses can be ordered from garden centres and also from specialist nurseries via mail order or the internet. It pays to get in early as those varieties new to the market and popular favourites always sell out early. Look around public rose gardens in your area to see which varieties are performing the best. If you are planning on planting some new roses in winter, autumn is the best time to prepare the soil. If re-planting into a spot where a rose has grown before, replacing the soil with some from another part of the garden can be beneficial. Add some compost or well rotted animal manure to the hole. For new garden beds, do the same and also add some lime or dolomite lime plus a sprinkling of blood and bone. Do not add any other fertiliser. Continue to water your roses with a good soaking every few days rather than lighter applications. Also keep the push hoe going to keep the surface loose and the weeds under control. April and May are also a good time to take cuttings of roses. Select stems that have previously flowered and are about the thickness of a pencil for large roses, smaller stems will do for miniature type roses. 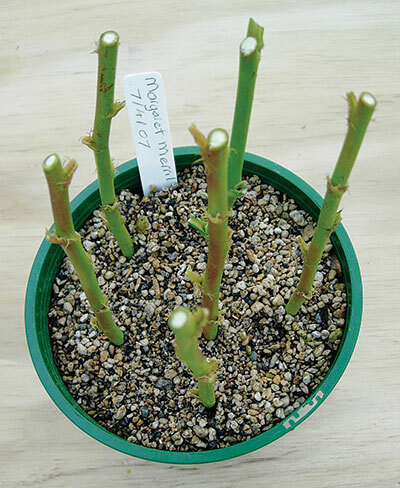 Cuttings should be 15cm to 20cm in length. Make a flat cut above a growth eye for the bottom cut and a slanting cut above the top eye, just as you do for winter pruning and remove all the leaves. Plant either into the garden or into containers with sand or pumice and always keep moist. Label and don’t be tempted to take a peak and see if roots have formed. There will still be some disease around over the autumn months including rust and powdery mildew. If it bothers you and you are into spraying, control with your usual fungicides. Insect pests such as caterpillars and aphids may also be present and these can be controlled with an insecticide. In May, it is time to start cleaning up around your roses. Hygiene is important as it helps to prevent diseases such as rust and black spot from overwintering. Pick up all fallen leaves and dispose of in the rubbish rather than the compost. 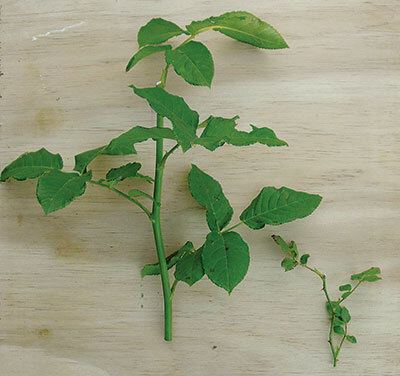 Take cuttings around 15-20cm in length. Cutting from a bush rose, one from a miniature. Make a slanting cut above the top eye and a flat cut beneath the bottom eye. Remove leaves.